Elise Ryan Stunning cream floral lace mini dress - size 10. Condition is Used. Dispatched with Royal Mail 1st Class. Frilly smock style shift dress. Very sophisticated Purple (looks more pink in the photos) dress from Oasis. Basic style, nice for dressing up/down. Black short sleeved faux leather dress. Faux Leather Dress. Straight up and down. Round cut neck and short sleeves. Great style for all year round. My daughters prom dress worn once from Forever Unique.As new. Worn only once at a Fashion Show. Bought then unwanted. Stunning silver sequinned mini dress or long top. Fully lined with toning grey satin materiel. Length from neck to hem at front 70cms. From neckline to hem at back 61cms. Ted Baker Little Black Dress "Aruna". Bow in the middle with pleats coming down. Hook and eye fastening. Soft touch. Ideal for the party season. The Emilio Pucci Gown as the one worn by the supermodelBar Refaeli on the red carpet attending and by Mariah Carey. Designer:EMILIO PUCCI. Fabric: 100 % Jersey. Very elegant Made in Italy cocktail dress with body con stretch under layer and light chiffon overlay. The dress is free from any zip fastenings and is designed to fit over the head. It has a pleated style pattern to the bottom half at the front and has a slight stretch in the material. 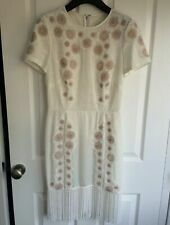 The dress is in a good used condition with few signs of wear. Ladies River Island Dress - Size 10. Condition is Used. Dispatched with Royal Mail 1st Class. Mango Black Puff Shoulder Silky Mini Bodycon Dress Size M 10. Condition is New with tags. Dispatched with Hermes Tracked. This colour is not for the faint hearted, it is a very bright spring green. Not lined. length is 32". OFor sale this stunning Designers Remix Collection LBD by Charlotte Eskildsen. This is Size 34 EU, Size 8 Uk. It features great Tailoring and Ruffled square shaped sleeves and trim features. This dress is Bnwot. Dispatched with Royal Mail 1st Class. Colour: Black. Short sleeves. Zip fastening to back. It has a round neckline, shoulder padding and long sleeves. Treat yourself! Dry clean. Bust/Chest; 40". Waist; 40". Is the great quality and styling that you expect from the fab Monsoon Originals label. It has a concealed zip in one of the side seams and is lined in red acetate sateen lining to prevent clinging (see close up photos). Beaded sequin pattern over lace. Accents Beaded. Material Rayon. Design Features Beaded. Occasion Formal. Spot clean only. 8” sleeve from shoulder. Style Maxi Dress. 40s 50s Landgirl WW2. Hook and eyes to fasten at back. HISTORY: Kate Moss Collection. Kate Moss IS fashion! Wear her clothes. Decade: 1930, 1940, 1950. Rich Teal Blue Fluid Silk. UK 6 in label ~ but due to the nature and style of the dress we estimate it may also fit UK sizes 8 - 10.